Look at these bobbins above and tell me what you see. Exactly: three lovely and well behaved bobbins not prone to unravel and get all tangled. My sewing machine gear pouch used to be a nightmare. 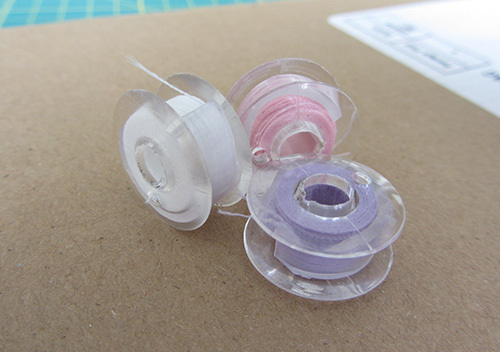 I came across this brilliant tip from Erin at SchlosserDesigns: slice some clear flexible tubing and fit on the bobbin. Isn’t it pure genius? I just love how some people have clever ideas and just share for free on their blogs. Thank you guys! Love the clear tubing idea! Yup.. so simple…. why didn’t I think of that? Great idea. I like the colours of cottons you have on your bobbins.